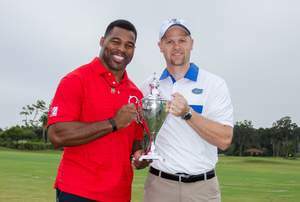 Heisman Trophy winners and College Football Hall of Fame recipients, Herschel Walker and Danny Wuerffel will host The Desire Cup golf tournament during the Florida vs. Georgia football weekend Oct. 29-31 at Ponte Vedra Inn and Golf Course (www.thedesirecup.com). PONTE VEDRA BEACH, FL--(Marketwired - Jul 23, 2015) - Heisman Trophy winner, College Football Hall of Fame recipient and former University of Florida quarterback, Danny Wuerffel will host The Desire Cup golf tournament along with Heisman Trophy winner, College Football Hall of Fame recipient and former University of Georgia running back, Herschel Walker during the Florida vs. Georgia football weekend Oct. 29-31 at Ponte Vedra Inn and Golf Course, located on Jacksonville Beach (http://www.pontevedra.com). The fundraiser is part of the 5th Annual Desire Cup Weekend presented by the nonprofit Desire Street Ministries, where Wuerffel has served as executive director for the past decade. "This is one of my favorite fundraising events with Desire Street Ministries because it brings together some of the greatest players from one of the most classic Southern football rivalries in the country," said Wuerffel. "It's also one of our most important fundraisers during the year. The funds raised through The Desire Cup weekend will help Desire Street Ministries positively impact hundreds of inner-city children and families through spiritual and community development programs." The upscale Ponte Vedra Inn and Golf Course is known as one of the premiere golf courses on the East Coast situated on a sprawling 300-acre beachfront site. The stunning lagoon course features undulating fairways, elevated Bermuda greens protected by steep-faced bunkers and a prevailing sea breeze accommodating for every kind of challenge imaginable. To celebrate the storied rivalry, two Gators and two Bulldogs will be paired up in true Ryder Cup fashion for the Friday (Oct. 30) Desire Cup golf tournament. Former football greats who have participated include Gators Emmitt Smith, Shane Matthews, Chris Doering, Travis McGriff, Terrence Barber, Judd Davis, Chris DiMarco, Billy Horschel, Wilber Marshall, Johnny Nichols; and Bulldogs Kevin Butler, David Greene, John Lastinger, Lindsay Scott, Musa Smith, Marcus Stroud, D.J. Shockley and former coach Vince Dooley. Other former football greats and Super Bowl champions Mike Ditka and George Rogers have also played in the tournament. The day of golf will conclude with an after-party barbeque awards celebration. The full weekend tees off on Thursday (Oct. 29) with an exclusive VIP cocktail dinner and pairing party for Desire Cup corporate package and title sponsors. The private event for sponsors will take place at a distinguished Gator alumni's luxurious beachfront home in Ponte Vedra. Sponsorship packages start at $5,000, and include many other benefits at various levels, including tickets to the Wuerffel Trophy banquet, a private fishing charter with Wuerffel and tickets to the Florida-Georgia game with transport via private yacht and brunch (more details at www.thedesirecup.com or call 678-681-3979). All golf participants of The Desire Cup can join Wuerffel poolside on Saturday (Oct. 31) at the Ponte Vedra Inn to watch the game and be an "armchair quarterback" with other former Gator and Bulldog greats. Individual golf packages are available for $1,500 per golfer. Special room rates, at the Ponte Vedra Inn are available for golf tournament participants starting at $209 a night if booked before Sept. 28 (for room block reservations and single or twosome golf packages call: 678-681-3979). To register for The Desire Cup 5th Annual Golf Tournament visit, www.thedesirecup.com or contact Sara Pace at space@desirestreet.org or 678-681-3979.